Terminals must be purchased from Ascend in order to function properly. Email our sales team at sales@ascendrms.com if you'd like to order one. To add the image to your payment terminals it needs to be sized to exactly 480x272 pixels and it needs to be in JPEG file format. If you're comfortable editing the image yourself, follow the steps below. If you'd like a hand setting up your images, email us at training@ascendrms.com to learn about our Payment Terminal Compatibility and Creative services. 1. Open the AscendRMS.com website and sign in. 2. Select Downloads from within the Retailer Portal. 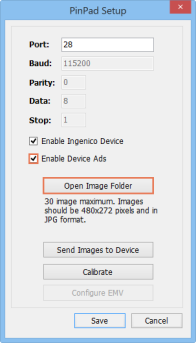 Then scroll to Marketing and click Ingenico Terminal Default Images. 3. The file downloads, and you can open it. The blank images include several different files formats, so you can be sure there's one that is compatible with the programs on your computer! Just make sure the "end result" is saved or exported as a JPEG. 1. Go to Ascend and click Options > Payment Processing > Pinpad Setup. 2. Check the Enable Device Ads box on this screen. 3. Then click the Open Image Folder button. 4. 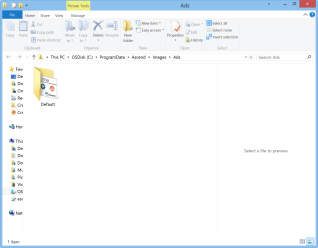 The Ads folder opens. The Ads folder is where your custom images will live. You can upload up to 30 images that will rotate based on the file name. Ignore the Default folder in Ads. 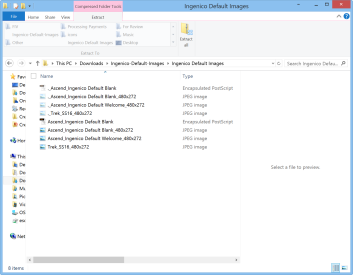 The Default folder is just for holding the default image that comes with the Ingenico. The Ingenico terminal will not recognize any new items placed in that folder. Sherpa Tip: Images must be sized 480 x 272 pixels or the equivalent ratio of smaller dimensions. They should also be saved in .jpg format and use the RGB color mode/profile. 5. Drag and drop (or copy and paste) your custom images directly into this folder. 6. If you’d like have your images display in a particular order, you can modify their filename to suit your needs. The Ingenico organizes the images in alphanumeric order. So an image starting with a number would come before an image starting with a letter. 7. Go back to the Pinpad Setup window in Ascend. 8. Click Send Images to Device to load your files onto the terminal. And that's it! Your Ingenico terminal will display your first custom image. If you added more than one, your terminal will show them in a slideshow.